As only befitting the day of Robert Burns’ birth, the Bridge Hotel had a Scottish Beer Festival on January 25. 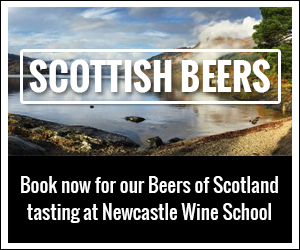 Seven Scottish breweries were on tap; including Fyne Ales, Tempest, Alchemy, Orkney Brewery, and Harviestoun. The pub, located on Castle Garth, has a lively atmosphere and plenty of taps featuring different beer styles. There was a sizable crowd of people enjoying ale – real or otherwise – but unfortunately the majority of the people did not realize there was a tap take-over going on. Chris Calver, another Newcastle native, talked about the seasonality of beer production and how Scottish breweries are noted for their seasonal offerings. According to the bar staff, the taps at the Bridge Hotel are changed weekly. Updates on guest beers, menu offerings, and events can be found at the Bridge Hotel’s Twitter feed: @BridgeHotel_SJF.